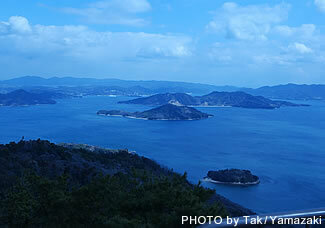 A look at the map on our top page will show you that only certain areas of the Seto Inland Sea are dotted with islands. Imagine the sea level 140m below that of today, as it was during the ice ages, and you can easily recognize today's islands as peaks of mountain ranges. 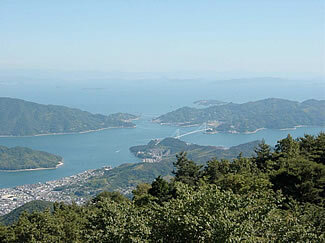 Large parts of the Seto Inland Sea Area are designated as National Park. Stricter development regulations, however, only apply to small areas, mainly island peaks. These specially protected districts are equipped with hiking courses, toilets, rest places and viewing platforms for visitors. And although the peaks are only about 500-600m high, the views really are spectacular. Go for a hike in spring, and you will encounter mountain cherry trees, blooming mandarin orchards and other delightful trees and flowers. Autumn will bring red and yellow leaves. In winter, the orchards along the lower slopes are full of yellow and orange citrus fruits and clear skies offer the best views of the year. Only in summer, when snakes, mosquitoes, hornets and other unpleasant insects are out, you should give preference to the beaches. The most climbed mountain on any island in the Seto Inland Sea is probably Mount Misen on Miyajima, where the forest is part of the shrine grounds and offers a variety of plants and animals you will not find anywhere else. On the other islands, it is sometimes difficult to reach the entrance to the trails, as they normally start from parking lots halfway up the mountain.